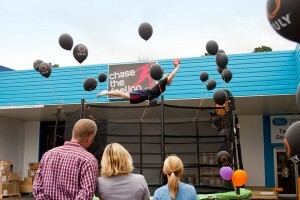 Searching trampolines in regional NSW? Look no further than Sportsmans Warehouse for all your trampoline Wagga Wagga needs! Despite Wagga Wagga being dubbed one of the most unusual suburb names in Australia, there's nothing weird about Sportsmans Warehouse Wagga Wagga when it comes to quality trampoline and sports equipment. The Sportsmans Warehouse franchise is a Canberra based, privately owned company that has been in existence for over 24 years. With the first store opening in Fyshwick ACT in 1983, Sportsmans Warehouse now has a total of 9 stores operating in Canberra and various Melbourne and Sydney suburbs including Dubbo, Orange, Shepparton, Tamworth and Wagga Wagga. Wagga Wagga is a suburb in New South Wales. Sportsmans Warehouse Wagga Wagga is located approximately halfway between Sydney and Melbourne and stocks Vuly's full range of trampoline products and accessories. To get in touch with Sportsmans Warehouse Wagga Wagga, contact Marcus on 02 6932 3320 or email wagga@sportsmanswarehouse.com.au. Sportsmans Warehouse Wagga Wagga is open 7 days a week, with Thursday opening hours extending to 9pm.